Ah, dome sweet dome. Scientists from NASA’s Dawn mission unveiled new images from the spacecraft’s lowest orbit at Ceres, including highly anticipated views of Occator Crater, at the 47th annual Lunar and Planetary Science Conference in The Woodlands, Texas, on Tuesday. The new images, taken from Dawn’s low-altitude mapping orbit (LAMO) of 240 miles (385 kilometers) above Ceres, reveal a dome in a smooth-walled pit in the bright center of the crater. Linear fractures crisscross the top and flanks of the dome with still more fractures slicing across the nearby plains. Like me, you’ve probably been anticipating LAMO for months, when we’d finally get our clearest view of the famous “bright spots”. Spectral observations have shown that the patches are consistent with a magnesium sulfate called hexahydrite that resembles the more familiar Epsom salts here on Earth. Scientists think these salt-rich areas were residue left behind when water-ice sublimated in the past. 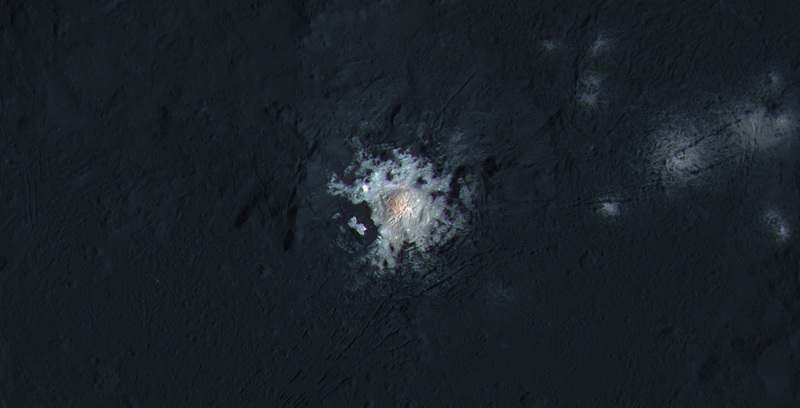 Impacts from asteroids could have broken into Ceres’ crust and possibly unearthed salt-rich ices. Exposed to the vacuum of space, the ice would have sublimated (vaporized), leaving the salt behind. 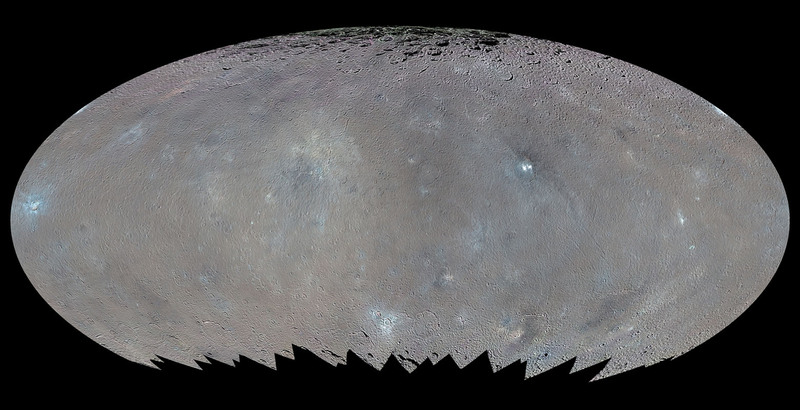 The team also released an enhanced color map of the surface of Ceres that reveals a diversity of surface materials and how they relate to Ceres’ landforms. The dwarf planet doesn’t have as many large impact basins as scientists expected, but the number of smaller craters generally matches their predictions. The blue material highlighted in the color map is related to flows, smooth plains and mountains, which appear to be very young surface features. We’re learning more about that subsurface ice thanks to Dawn’s Gamma Ray and Neutron Detector (GRaND). Neutrons and gamma rays produced by cosmic rays interacting with the topmost yard (meter) of the loose rock and dust called regolith provide a fingerprint of Ceres’ chemical makeup. Lower counts indicate the presence of hydrogen, and since water’s rich in hydrogen (H2o), the results from GRanD suggest concentrations of water ice in the near-surface at high latitudes. 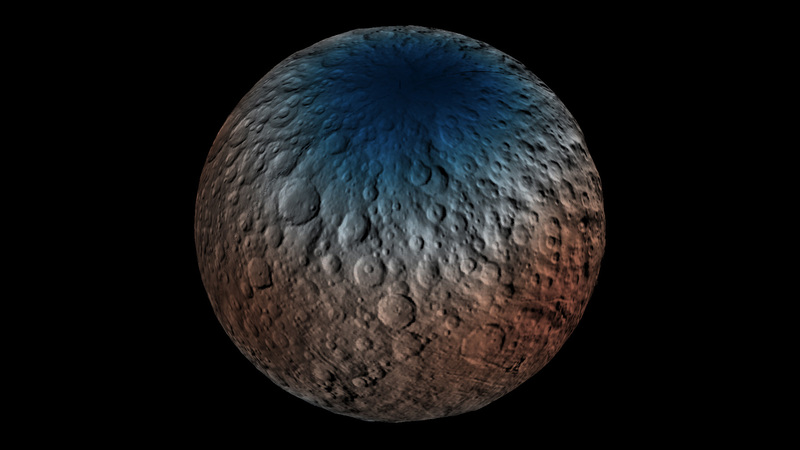 “Our analyses will test a longstanding prediction that water ice can survive just beneath Ceres’ cold, high-latitude surface for billions of years,” said Tom Prettyman, the lead for GRaND and Dawn co-investigator at the Planetary Science Institute, Tucson, Arizona. Dawn scientists also reported that the Visual and Infrared Mapping Spectrometer (VIR) has detected water at Oxo Crater, a young, 6-mile-wide (9-kilometer-wide) feature in Ceres’ northern hemisphere. This water could either be bound up in minerals or exist as ice and may have been exposed during a landslide or impact or a combination of the two events. Oxo is the only place on Ceres where water has been detected at the surface so far. Not only have scientists found evidence of possible extensive subsurface ice, but the composition of the surface is variable. Using VIR, which measures mineral composition by how those minerals reflect sunlight, they found that Haulani Crater shows a different proportion of surface materials than its surroundings. While the surface of Ceres is mostly made of a mixture of materials containing carbonates and phyllosilicates (clays), their relative proportion varies across the surface. 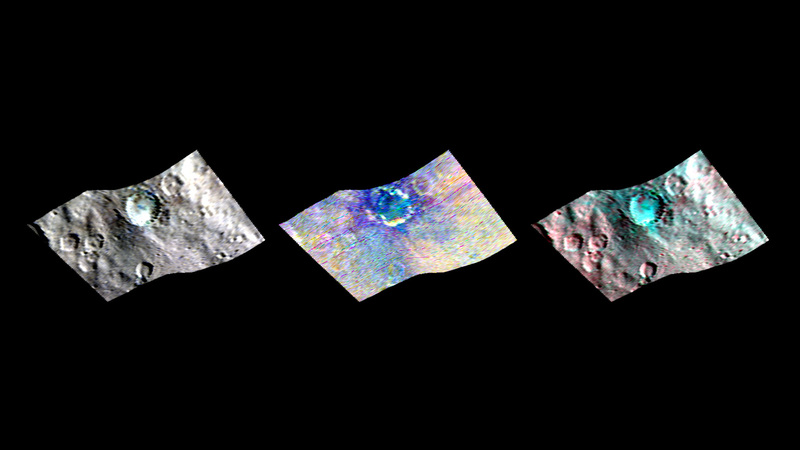 “False-color images of Haulani show that material excavated by an impact is different than the general surface composition of Ceres. The diversity of materials implies either that there is a mixed layer underneath, or that the impact itself changed the properties of the materials,” said Maria Cristina de Sanctis, the VIR instrument lead scientist. All these cool stuff we’re finding out about this small body makes it nearly as exciting as Pluto. Taking a closer look is the best form of education. Humans, cars and planets are made of molecules. And molecules are made of atoms. Atoms are made of protons, neutrons and electrons. What are they made of? This is the standard model of particle physics, which explains how everything is put together and the forces that mediate all those particles. Physicists knew the interior of the atom contained protons, neutrons and electrons, but they didn’t understand exactly how they were organized. It took Ernest Rutherford to uncover our modern understanding. Why Can’t We See the Big Bang? Since telescopes let us look back in time, shouldn’t we be able to see all the way back to the very beginning of time itself? To the moment of the Big Bang? You’ve probably heard that looking out into space is like looking back in time. As it takes light 1 second to get from the Moon to us. Whenever we view it, we’re seeing it 1 second in the past. The Sun is 8 light minutes away, and the light we see from it is from 8 minutes into the past. A better example might be Andromeda, it’s 2.5 million light years away… and you guessed it, we’re seeing it 2.5 million years in the past. Since the Big Bang happened 13.7 billion years ago, using this idea, shouldn’t we be able look all the way back to the beginning of time, even if we’ve misplaced the key to our Tardis? At the very beginning of the Universe, seconds after the Big Bang, everything was mushed together. Energy and matter were the same thing. Dogs and cats lived together. There was no difference between light and radiation, it was all just one united force. You couldn’t see it, because light didn’t actually exist. There were no such thing as photons. However, if you’re still insisting there’s no such thing as photons, you might want to check yourself. After these things started to separate. Photons and particles became actual things. Electromagnetism and the weak nuclear force split off and formed new bands, but could never quite get the momentum of the original lineup. By the end of the first second, neutrons and protons were around, and they were getting mashed by the intense heat and pressure into the first elements. But you still couldn’t see that because the whole Universe was like the inside of a star. Everything was opaque. It was Scarlett Johansson hot, and too crazy to form stable atoms with electrons as we see today. After the Universe was about 380,000 years old, it had cooled down to the point that proper atoms could form. This is the moment when light could finally move, and travel distances across the Universe to you and get caught up in your light buckets. In fact, this light is known as the cosmic microwave background radiation. So, how come we don’t see all this freed light in all directions with our eyes? It’s because the region of space where it exists is so far away, and travelling away from us so quickly. The light’s wavelengths have been stretched out to the point that light has been turned into microwaves. It’s only with sensitive radio telescopes and space missions that astronomers can even detect it. Unfortunately, we’ll never be able to see the Big Bang. Even though we’re looking back in time, right to the edge of the observable Universe, it’s just beyond our reach. If you could look at the Universe at any point in time, what would it be? Tell us in the comments below. The number of protons defines an element, but the number of neutrons can vary. We call these different flavors of an element isotopes, and use these isotopes to solve some challenging mysteries in physics and astronomy. Some isotopes occur naturally, and others need to be made in nuclear reactors and particle accelerators.